Successfully Added NO.1 D5 Android Smart Watch - 3G SIM, BT4.0, Wi-Fi, Google Play, Pedometer, Heart Rate, GPS, Barometer (Silver) to your Shopping Cart. No.1 have introduced a new sleek smart watch that's a fully independent phone, with an Android OS the No.1 D5 is much more than a watch and lest you enjoy all the functionality of a Smartphone on your wrist. Designed with the traditional round face the D5 smart watch has a 360x360 display and cool metallic housing that's compliment with a stylish leather wrist band. An Android 4.4 OS brings a smooth user interface and built in sensors bring barometer, weather forecast and fitness readings to your wrist. 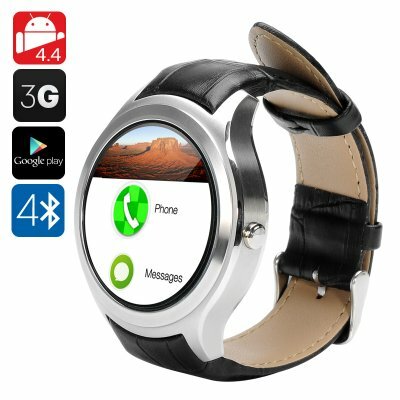 The D5 smart phone watch has 3G support allowing you to connect to the web without the need for a Smartphone. It also has Wi-Fi support so you can browse the internet without the need for a data plan. And with Google Play on the watch you can download your favorite apps and keep in touch via Whats App, Facebook, twitter and many more. At the heart of this smart phone watch is a MediaTek MT6752 processor that is based on the energy efficient ARM Cortex A7 architecture. This processor supports wide connectivity options including Wi-Fi, Bluetooth and GPS so you can easily transfer files, download apps, sync to your Smartphone and a whole lot more. The GPS support lets you have access to on wrist navigation and Android’s 4.4 “OK Google” voice commands makes navigation a doddle so getting lost is a thing of the past. A 450mAh battery brings a full day of life to the smart watch so whether you pair it with your phone or insert a SIM into the watch you can enjoy a day’s worth of fun between charges. The NO.1 D5 Smart Phone Watch comes with a 12 months warranty. Brought to you by the leader in electronic devices as well as wholesale phone watches..